Net gain on financial assets classified at as fair value through profit and loss amounted to US$25,177 compared to US$434,060 last year. For the three months, net loss on financial assets classified as fair value through profit amounted to US$198,187 compared to a 2016 gain of US$366,532. Interest from loans and receivables amounted to US$143,215 a 16% year over year increase, while the company had no dividend income compared to US$53,528 reported last year. As a result, revenues totaled US$168,392 for the six months a 72% decline (2016: US$611,290). Administrative and general expenses amounted to US$389,435 for the period a 147% increase year over year (2016: US$157,956) and US$194,022 for the three months a 176% increase compared to US$70,417 reported last year. 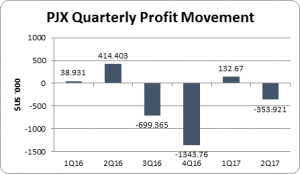 Consequently, PJX’s loss for the period totaled $US221,251 compared to profits of US$453,334 reported last year. Loss for the three months was reported at US$352,921, this compared to profit reported in 2016 (2016: US$414,403). Loss per share (EPS) amounted to US$0.00071 (J$ 0.09) for the six months and US$0.00114 (J$0.15) for the three months. An exchange rate of 1US$ = J$129.65 as at August 31, 2017 was used. The 12-month trailing loss per share is US$0.0073. The number of shares used in this calculation was 309,968,261 units. As at August 31, 2017, PJX recorded total assets of US$23.58 million compared to US$25.89 million reported in 2016. The major changes in assets included the transfer of Cash and short-term deposits of US$21.10 million in 2016 (2017: US$2.86 million), to Financial Investments which valued at US$15.21 million in 2017 compared to US$4.65 million in 2016. Total Stockholders’ equity as at August 31, 2017 closed at US$23.58 million a 9% decline to the US$25.89 million reported in 2016. This resulted in a book value of US$0.08 (J$9.85) per share.